Shetland independence campaigner Stuart Hill has failed in a bid to have Sheriff Philip Mann stand himself down from presiding over a vandalism trial this week. 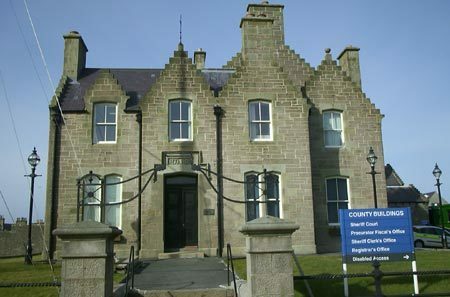 At a hearing in Lerwick Sheriff Court on Monday, the 74 year old suggested the sheriff showed “personal bias” against him in previous cases last year and alleged that he was part of a “conspiracy to pervert the course of justice”. Last year, Hill – who believes Shetland is not legally part of Scotland or the UK – was taken to the police cells after refusing to appear in the dock, which resulted in the man from Cunningsburgh later serving 16 days behind bars for contempt of court. Yesterday the campaigner made a number of allegations against the court and prison system, including that they apparently held a hearing in his absence and created “falsified” documents relating to this time in the cells and in jail in Peterhead. Sheriff Mann rejected Hill’s request for him to stand down from judging his trial on Thursday and said he had always acted in line with his professional duties. The sheriff said that he had “no control” of administrative issues like minutes or warrants and added that Hill could have appealed rulings made in court. Hill, of Ocraquoy, is due to face trial on Thursday accused of removing a secured plyboard sheeting, cutting a padbolt, removing a padlock and causing damage to the building at North Bridge Stores in Cunningsburgh on March 1.